The secret’s out, I am a huge introvert. After taking the Myers-Briggs Personality Test, I wasn’t at all surprised to find I am an ISFJ type (the ‘I’ meaning introvert). This is not new information to me, I have never wanted to be the centre of attention or introduce myself to new people and if anything, I have worn an introvert badge with pride for my whole life. But then I became a creative business owner. It was necessary for me to put myself out there to try and get clients and build the business which sustains my introverted lifestyle sitting in my house and avoiding humans… And part of marketing my business includes building a following on social media. Social Media is something that has never come naturally to me. I like to follow other people’s updates but I have never felt comfortable pushing my own thoughts onto others. I would send the odd tweet about the weather or post a picture of a new lipstick but nothing that was engaging or, let’s be honest, interesting. Recently, I have managed to create some rules for myself which make me post regularly and finally, my follower numbers are on the up and I am really engaging with people online in a meaningful and helpful way. Here are my tips for you to do the same. Facebook, Twitter, Instagram, Snapchat, Instastories, Pinterest, YouTube, Periscope etc. etc. There are so many social platforms to keep up with and it can give you a bit of a headache. Always remember that you don’t have to use everything and it’s ok to just stick to the platforms which feel like a good fit for you. 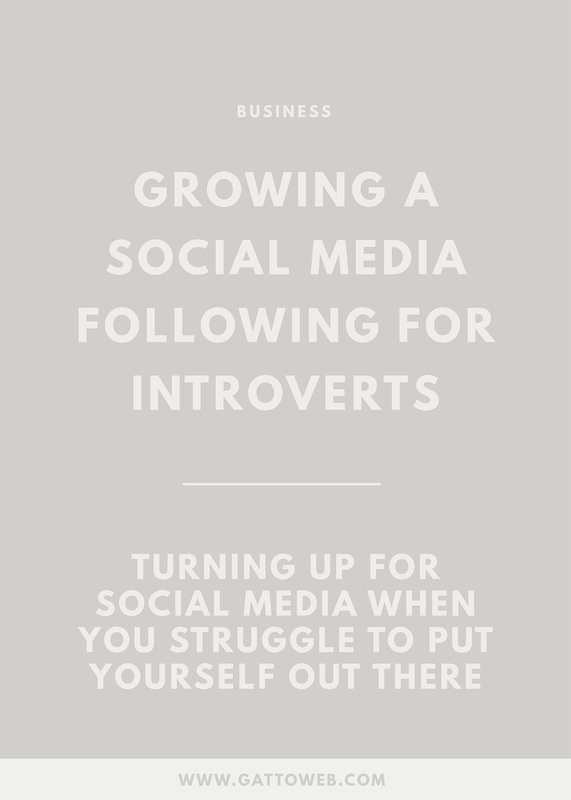 My main platforms are Twitter, Instagram and Pinterest and then I spend a bit of time on Facebook groups when I feel like putting myself out there a bit more. It’s fine to stick to your comfort zone as forcing yourself to use other platforms may put you off doing everything. Scheduling your social content takes you out of the equation of the actual posting which is where you may get the jitters. Using a scheduling tool makes it feel less like you are putting yourself out there and more like you are just doing a day to day task. As well as the scheduled content, try and add in some personal updates here and there so you don’t look like a robot! As an introvert, it difficult to ‘make the first move’ and engage with people you follow. To try and cut out this step, create social content which invites people to contact with you. Ask questions or see if people can give you some advice and then once they have started a conversation, you will feel more comfortable replying and talking one on one with another person. This will feel much easier than throwing a reply out into the social abyss and once you get used to engaging, it will come more naturally. Chances are on your many social platforms, you will be following hundreds if not thousands of people. It can be a little overwhelming to keep up with everyone and comment on all of the things. If you don’t know where to start, gather up a few people that you want to connect with and start by engaging with them. When you get used to having regular social conversations, bring in a few more gradually so you are easing yourself in. The connections that you create on social media will most likely lead you to finding people who are like-minded and similar to yourself. Don’t be afraid to make friends with people you meet online, it is no longer unsafe to befriend strangers you meet on the internet (although make sure you know who they are!). Find the people who you really get on with and connect with regularly and make them your own tribe. Having people online who have your back can make a much better environment for posting content. I don’t know about you, but if something is on my to-do list it HAS to be ticked off. So, if I add spending a bit of time on social media to my to-do list or my calendar, it will get done. What I generally do it schedule an hour every now and then to engage with people on Instagram or comment on a few Facebook groups. Setting specific times and having a little reminder means I generally stick to this and I spend much more time on social media than I would if I didn’t have the time set aside. There are some periods of time where I actually come out of my introverted shell and don’t mind interacting with people. Not everyone will experience this but if you do, I encourage you to ride the extrovert wave whilst you can! If you feel a bit more comfortable engaging at certain times, use these times to do lots of interacting with people on social media or scheduling your sales-y content which usually feels unnatural. When your focus is growing your numbers, it can be a bit of a knock back if you lose a few here and there. But remember, you are trying to grow an audience who get you and if someone doesn’t, you aren’t losing out by them unfollowing you. The people you want to follow you are people who engage with you, who want to hear more from you and are interested in things you are interested in. Losing followers when you talk about a niche interest? Chances are you will gain more who have the same interests further down the line! The greatest advice I can give is to completely be yourself on all social media channels. It can be enticing to follow the ‘my life is perfect on social media’ trend but it is much more relatable if you just present your personality exactly how it is. You are much more likely to create meaningful connections and build a following of like-minded people if you present yourself the way you are ‘in real life’. Are you an introvert? How do you find engaging on social media? Let me know in the comments!